We’ve been awarded some funding from Southwark’s Community Council to bring a magical lantern bauble walk to Dog Kennel Hill Woods this December. 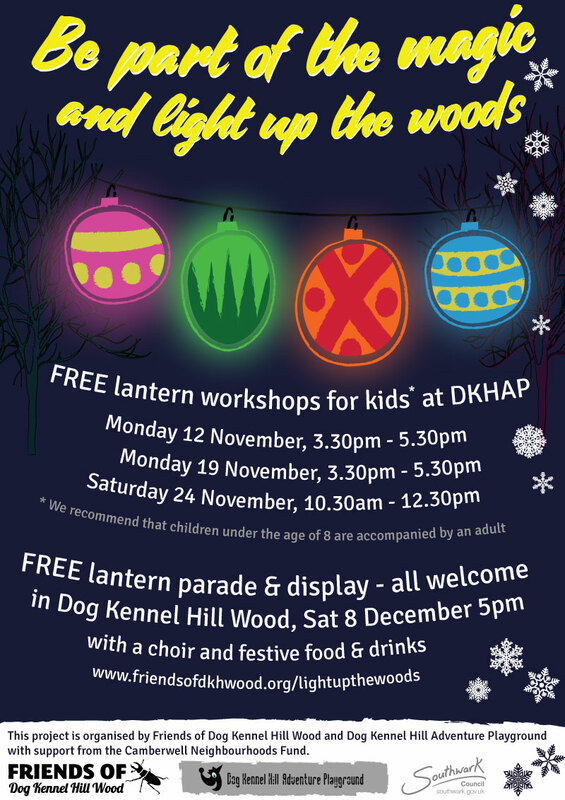 We have teamed up with Dog Kennel Hill Adventure Playground who will be running three *FREE* lantern-making workshops for children on Monday 12th Nov 3:30 – 5:30 pm, Monday 19th November 3:30 – 5:30 pm and also on Saturday 24th November 10:30 am – 12:30 pm. These workshops take place at the adventure playground and will be taught by artist Maria. All materials are provided for and you can drop it at any one or all of the workshops to make a paper lantern. We recommend that children under 8 are accompanied by an adult as the lantern-making process can be tricky for younger children and they may need some help. The lanterns will then form part of a procession to Dog Kennel Hill Woods on Saturday 8th December where they will be hung in the trees to form a magical bauble walk. The procession is on Saturday December 8th at 5pm. There will be refreshments and a choir and we welcome everyone to attend and join in. We are hoping that this event will open up the woods and transform it into a magical space during one of the darkest times of the year. The lanterns will stay up in the wood for a week and will be available for collection by the makers to take home for Christmas.